Introduction: Brahma-Sutra’s, also called Vedanta-Sutra’s are composed by Sage Krishna Dvaipayana Veda Vyasa, also known as Badarayana, believed to be the very incarnation of the Supreme Being. They form along with Upanishads and Srimad Bhagavad –Gita, as the core shell of Sanatana Dharma as present in the Vedas. This triad of Sacred Scriptural texts is revered and termed as ‘Prasthana-Trayee’ or the three pillars of spiritual wisdom. They are in composition, short terse statements forming authoritative codes pointing to the true meaning of Upanishadic teaching. Approach to understand Brahma Sutras: To comprehend the meaning of Brahma-sutra’s and de-coding their meaning, one has to be guided by any one of the major commentaries written by the gifted masters and scholars of the yore. 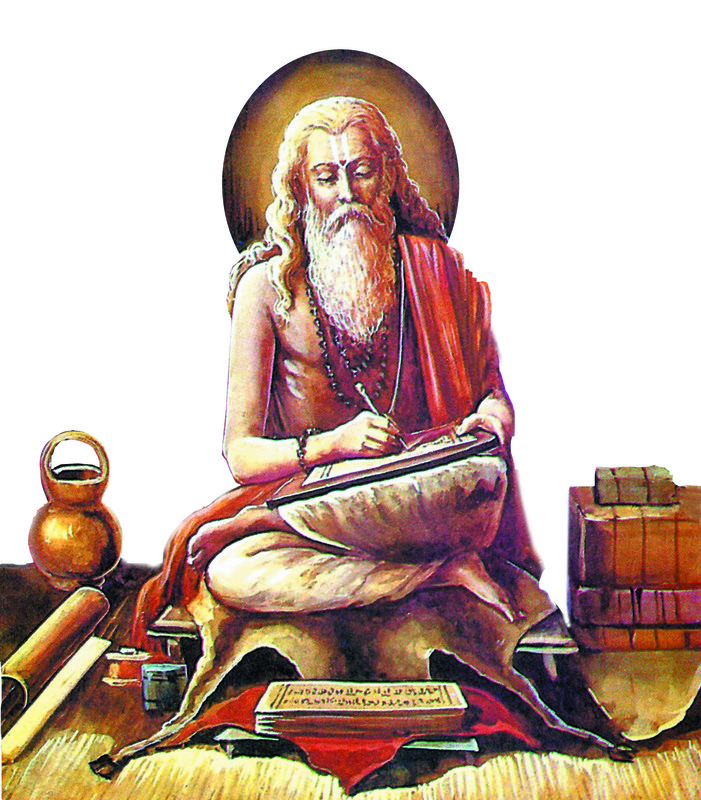 More than fifteen commentaries are known to have been written by illustrious seers such as Shankara, Ramanuja, Madhva, Vallbha, Nimbarka, and others. However in the opinion of Vedantic scholars of east and west, the first named three are considered as principal commentators. However, amongst the commentators, there is no unanimity of interpretation or expression. Their interpretation forms the foundation of three different schools of metaphysics: Advaita (Shankara), Vishista-advaita ( Ramanuja) and Dviata (Madhva) .Rest of the commentators fall in between adapting intermediate positions in the shades of this philosophical spectrum. Advaita advocates that Only Brahman is Ultimate Truth and rest all is illusion. The Jeeva’s are but specs of Brahman, covered with ignorance Maayaa. When Jeevas are liberated from the shell of illusion surrounding them called ‘A-Vidyaa’ they realize their ‘true nature’, namely The Brahman. Madhva on the other hand, using the same evidence base used by Shankara and Ramanuja, advocates that Jeeva and Brahman in all respects are different; Jeeva is always dependent on Brahman; Brahman is always Independent. The two are like the source of light and it’s reflection in a media- Bimba and Pratibimba, like Sun and its image in water. Madhva considers Brahman as excelling in all respects sarva-guna-paripoorna while Shankara describes Brahman as nivikara-nirguna an entity which cannot be attributed with any quality. Ramanuja has an intermediate position. His school believes that the Jeeva is one with Brahma, yet there is a difference; Jeeva does not entirely become one with Brahman, even on liberation Moksha. Differences in Schools of interpretation: There are fundamental doctrinal differences between these schools which are the subject matter of continuing and raging debate between the followers of these masters, ever since they were formulated and juxtaposed. Even there are differences in the recognition of the textual outlay and division by number of aphorisms and organization by sections. For example, Shankara counts 555 aphorisms grouped in 132 adhikaranas. Madva counts 564 aphorisms grouped in 223 adhikaranas. Ramanuja counts 545 aphorisms in 156 adhikaranas. The major classification of the Brahma sutra text in to Four major sections – Padas is common to all. Shankara’s (commonly accepted date- 788–820 CE) commentary is called as ‘Shaareeraka meemamsaa’ . Ramanujas (1017–1137 CE) commentary is called Sri Bhashya. Madhvacharyas (1238–1317 CE) wrote four compositions on Brahma Sutra interpretation, out of which two are considered major, namely – Brahmasutra-bhashya and Brahmasutra-anuvyakhyana. 4. The Universe, it’s contents, Process of its Creation (cosmology). 8. Knowledge, Devotion, Duty and Self-Realization. 9. Multiplicity of other metaphysical concepts and subjects, such as evidence (Pramana), Cognition and Consciousness (Chaitanya), and so on. Brahma Sutra Bhashya – Sub commentators: The subject of ‘master commentators’ (Bhashya Kara’s) deserves mention of a number of their luminary disciples, who further expanded the metaphysical thought enriched and highlighted the genius of these writings. Shankara : vAcaspati miSra – (bhAmatI), appayya dIkshita ( parimala), padmapAda (pancapAdikA), prakASAtman ( vivaraNa). Ramanuja : Vedanta Desika (Tattva Tika) , Appayya-Diksita ( Naya-mayukha-malika). Madhva: Jayateertha (Nyaya Sudha), Vyasateertha ( Chandrika) Raghavendra Yati ( Parimala). Many scholars marvel at the brilliance and outstanding scholarship of these disciples. Jijnysa Adhikarana (Chatuh sutra) Key to understand Brahma Sutras: Traditionally the first four aphorisms of first pada of Brahma Sutras – Jijnysa Adhikarana are considered the stepping stone to the understanding of Brahma sutras focus. We give these and indicate the broad meaning of these aphorisms without differing sectoral nuances of Vedanta schools. The beginning and end sound ‘ Om’ is a reverential tribute seek the grace of the Divine in the enquiry. Jijnyasa is the desire to know. Brahma Jijnyasa is the undertaking to know about Brahman – The Supreme Being. At the beginning of this aphorism, there are two more words: Atha and Ato. Atha, normally means ‘now’, in the beginning’, connoting that we have fulfilled the pre-requites for such an enquiry, namely the faith and practice of Sanatana Dharma and thus, are qualified for this task. Ato indicates the reason for undertaking this arduous task. Obviously our motivation to understand Brahman is to seek salvation and experience the ultimate bliss of Moksha. Why is this inquiry so crucial? Because Brahman is the creator (origin), the sustainer and dissolver of the entire universe. We being a part of the universe, whatever our nature is, we must inquire about His nature, if we have to seek deliverance. Inquiry of the ultimate Divine is a must for all ! How do we proceed on our quest? What is the source we seek for the necessary knowledge in this inquiry? Obviously, it is the scriptures which are the primordial source of this knowledge. The Vedas, Vedantas and by implication, all the shruti’s and smriti’s, relevant sources from Puranas provide the inquirer with the guidance in our voyage of discovery. And finally, samanvaya ,( made up of two words – Sam and Anvaya) the proper understanding of these source books, the comprehension of the essential principles of the Shastras is what the inquirer has to use for comprehending the kernel of the vast ocean of knowledge. While for any scholar, this is the most simplistic explanation on these very four aphorisms, volumes and volumes have been written to highlight the endless expanse of vedic thought for the beginning of our humble journey, for the neophyte and common people, this in our opinion is the starting point for this absorbing journey which may take not just a life time, but several births and God’s grace to arrive at his domain.